For Civil War historians living outside of Louisiana, Pierre Gustave Toutant Beauregard is a colorful figure. For many, he is an underrated commander. For others, a figure who is exotic and comical, particularly given his overly dramatic statements and pronouncements. In Louisiana though he is something more, one of the state’s most famous natives. His roots go back to the founding of the colony. Beauregard’s family were the Toutant-Beauregards. The French Beauregards married the last survivor of the Toutant family, Welsh refugees from Edward I’s conquest of Wales (1277-1283). The first to arrive in French Louisiana was Jacques Toutant-Beauregard, who led a convoy that brought supplies to Louisiana during the War of the Spanish Succession (1701-1714). Jacques brought back timber to France and won the Cross of St. Louis for his actions. He moved to Louisiana after the war. In 1766 the Spanish took possession of Louisiana after France gave the unprofitable colony away in the Treaty of Fontainebleau. Louis, Jacques’ son, allied himself with the Spanish and became a wealthy planter in St. Bernard Parrish. He also became an officer in the Spanish army. In 1779, Élie Toutant-Beauregard, a relative of Louis, ran supplies to the Americans during the American Revolution. This assistance was one reason P.G.T. Beauregard was accepted into West Point. Beauregard’s mother was Hélène Judith de Reggio, descended from the illustrious Modena family. His father, Jacques Toutant-Beauregard, was the master of a profitable Toutant Nord sugar-cane plantation in St. Bernard Parish. Although Louisiana had been American since 1803, St. Bernard was still thoroughly Creole in culture and language. 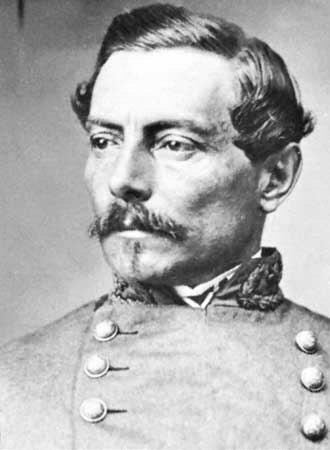 Beauregard was born at Toutant Nord on May 28, 1818. The plantation was eventually dubbed Contreras, in honor of Beauregard’s role in the battle in the Mexican-American War. In 2017 New Orleans’ removed a grand statue of Beauregard at the entrance of City Park. Of all the removals, it was the most divisive given Beauregard’s local accomplishments as an engineer, civic leader, and businessman. Yet, it is not the only monument to the general in the region. Tucked away on the edge of the state, in a place closer to the Gulf Mexico than it is to New Orleans, is a pyramid dedicated to Beauregard. It is also dedicated to his family, naming his children, first wife, parents, and grandparents. The monument was designed by Earl Desselles, sometime after World War II but before Richard Nixon became president. It was subsidized by Judge Leander H. Perez. He was a controversial figure, an ally of Huey P. Long who ran Plaquemines Parish with a tight grip and was willing to defy anyone who trampled on his truf. During the fights over de-segragation in Louisiana, Perez took a hard-line. He infamously threatened to jail Civil Right activists in Fort St. Philip. One of the only things he did that drew wide support was the restoration of Fort Jackson, which was a museum until it suffered major flood damage in Hurricane Katrina. I wanted to find the monument but was unsure exactly where it was located. Instructions were vague and merely placed it on Bayou Road. I also wanted to find the grave of his first wife, Laure Villeré, and his son Henri, who served on his staff during the Civil War. Along with Andrew Simoneaux, an old friend and photographer, we set out down river, passing Arabi, the Chalmette Battlefield, Meraux, and Violet to St. Bernard, the oldest community in St. Bernard Parish. The surprise across from the Laure/Henri tomb was the tomb of Beauregard’s parents, Hélène and Jacques. I had found Jacques’ short obituary, but I found nothing for Hélène’s death. The tomb indicated that she died on October 5, 1848. Also buried there, with a worn down plaque, were Hélène’s parents. While Andrew took pictures I stopped in the St. Bernard Church to ask a few questions. It is a small and simple structure. The inside was quiet and quaint. Unfortunately, there was no rector, despite the office hours posted. I was wondering if we would find the Contreras monument as easily as we found the resting place of Laure and Henri, and hoping the rector could help. Driving down Bayou Road, we saw a road closed sign. An earlier one had forced us to a detour, but just there at the end was the Beauregard monument. It is intimate, if lacking in the artistic grandeur of the New Orleans one. The spot is now a private park. The flag poles have been abandoned, but there are benches and some of the most lovely oaks I have ever seen, one of them sprawling on the ground and creaking as the breeze brought much needed cool air. Confederate monuments have been coming down, mostly in America’s big cities and universities. Yet, tucked away in the small town and the countryside are places where removal is unlikely to ever happen, due both to money and memory. Sadly, it reminds one of the general drifting apart in contemporary America. We left the monument and grabbed snowballs, a New Orleans favorite, from a small roadside stand. We had just enough time to photograph the home of René Beauregard, the general’s older son. During the war he commanded an artillery battery. After it he became a judge, historian, and quixotically a Republican. His home, which is at the Chalmette Battlefield, can be visited but is currently closed for repairs. Thus ended a day of accomplishment cut with a streak of melancholy. Leon, Beaux, Belles and Brains of the Sixties, 293. This entry was posted in Antebellum South, Monuments, Personalities and tagged Beauregard Family, Beauregard Monument, Contreras, New Orleans, P.G.T. Beauregard, Sean Michael Chick, St. Bernard Cemetery. Bookmark the permalink. This reminds me of my visit to the Port Hudson battlefield last October. The ranger seemed amazed that I wanted to visit the battlefield “on purpose.” The ranger and I had both lived in California at one time, so we had some common things to remember, but he’d returned to Louisiana to live. Most of the Port Hudson battlefield is gone, from natural erosion and industrial development. I seemed more interested than the “locals.” Studies show that Louisiana has some of the most “unhappy” citizens in the United States, and you can sense the racial and cultural “uneasiness.” Its almost like, what does it matter what I do, life is unhappy and my future is “unbright”, distrust the motives of others, shot your rifles and pile up your trash, hunker down and just get through the day, like alligators. Your comments are so off-base as to be almost laughable if they weren’t so ignorant. And quite frankly I don’t believe your comments about the ranger; I took a guided tour with him in February to a part of the battlefield now in private hands, and he expressed no such “amazement” that locals would want to attend such an event. Plenty of “locals,” myself included, visit Port Hudson several times a year, “on purpose,” that is when we’re not shooting our guns at trash piles, and generally behaving like alligators. My only visit was in 2007 before I moved to Pittsburgh (after a stint there and in Kentucky I returned to New Orleans in 2012) and it was pretty empty. It was also a weekday and before recent events made the war personal again. Indeed, attendance at the New Orleans Civil War Museum has shot up. I hope you both liked the post. I can say this as a tour guide, attendance on my tours went down after we removed some. Many of my fellow guides think monument removal had no bearing on that because they supported removal. I disagree, although I concede there are bigger reasons for our slump. On the other side, our new mayor wants to put them up at Greenwood Cemetery near a monument to dead Confederate soldiers. Descendants of Islenos prefer to be called Islenos, not Creole.